The Trash Can: AIN'T THAT THE TRUTH! +D LeeSr. That's because those nominal 'Christians' aren't convinced that the organization that promotes this 'holiday' is the same organization that tortured and crucified JESUS Christ: the Roman Catholic church, which is the successor to the Roman Empire with a 'Christian' veneer. Furthermore: the Lord JESUS Christ never celebrated His birthday and birthday celebrations are just as pagan-Babylonian as 'Christmas. And last but not least: our Lord JESUS Christ was probably born in September, so there's no reason to commemorate His day of birth on the 25th of December. 1. "MERRY" - It is among the DEADLIEST time of year. 3. "MASS" - Admittedly an invention to replace the Passover, Christ commanded his disciples to keep in the Gospels. IT IS NOT "A CHRISTIAN" HOLY-DAY. Those who embrace that POV, embrace a definition of both their "Christ" and their "Christianity" that is anti-Biblical in nature and spirit. Not simply "extra-biblical", but Anti-biblical. (A "Christ" which is not "Christ") Their insistence that it is, despite the fact that it isn't, is an intentionally embraced delusion, which they also wish to force on others through deception, compulsion, intimidation and persecution. There is no "good will toward men" in any of it. The "good" it is surrounded with, is "over-compsenation" for the historically demonic nature, of what it really is. The picture of the "Head on a Pole" at the end of the video, is the head of the man who had it separated from government sponsorship in England, in favor of religious freedom, and a separation of Church and State. His head was left on a pole to rot, right in front of the Anglican Church, for decades, until the pole itself was snapped by a storm. (Good will toward men?) That's the truth about this horrific ritualistic annual occult practice, of switching the definition of God and Satan. (To justify the practice of apostate European "Church-states" who chose that path, despite what they fully knew it to be). For this very reason, all "Christians" in America, consistently rejected the practice, for 2 entire centuries, and rightly considered it demonic. It still is. Nothing has changed. America's Christians supported the creation of the 1st Amendment to keep it from being enforced through government compulsion, in the United States. The fact you may "like it" and surround it with pleasure, and pleasant things, does not change what it is. It is a lie. And that is all it will ever be. No matter how much sugar, lights, booze and crosses you bury it under. It is also, unkown to most Christians today, openly and direclty referred to throughout the New Testament, in numerous direct warnings, denounciations and condemnations. From Christ himself [Mtt.7:21-23] to his Apostles [1 Cor.10:20] to the book of Revelation [Rev.9:11, 11:10]. 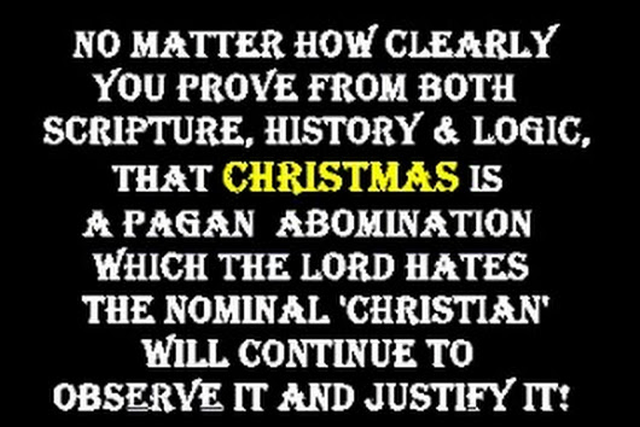 People who do not endorse lying in the name of God, and do not therefore observe Christmas, are bombarded every year with forced responses to others, who see it as either their "American" or "Christian duty" to intentionally harass them with "Merry Christmas" (even when it is known they do not observe it). When the truth is, it is neither "American" or "Christian" of them, on either count. And religious leaders in America today, (who claim to be "Protestant"), have failed to educate their congregations about the truth of the theology and history behind this issue, because most of them are simply impostures, frauds and con-artists, using religion to make money. Nothing else is there. There is no "polite way" to respond to cashiers, waiters in resteraunts, or strangers who mouthed the required confession, other than acquiesce, or to simply keep quiet. But for those, you know personally, who make it a personal mission in your world, to intentionally harass you when they know you do not observe Christmas, by bombarding you with "Merry Christmas" every year... here is something, just for them. Satan says the earth is a BALL, but Satan is a LIAR, because the earth is FLAT and 'gravity' is a LIE.